Pioneers in the industry, we offer fully automatic non woven bag making machine, integrated 4 high tower machine, fully automatic non-woven handle bag making machine, 3d gusset box bag making machine, non woven fabric bag making machine and automatic box type non woven bag making machine from India. Within the short time period, we are engaged in presenting an excellent grade of Fully Automatic Non Woven Bag Making Machine. The offered bag making machine is developed in accordance with industry norms and quality parameters. In the offered bag making machine, all the components and material used have been approved and certified by agencies. In addition, this bag making machine is built and developed adhering to industry norms. Furthermore, our professionals opt for strict quality inspection made on the bag making machine to ensure high performance. 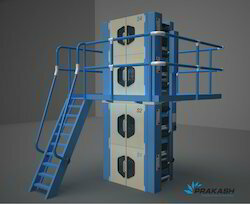 With phenomenal market understanding, we are able to introduce an extensive range of Integrated 4 High Tower. This machine delivers paster solution for printing daily newspapers, periodicals, posters, books and circular printing with a variety of colors, pagination, and capable of printing 4 colors on either side of the web (4+4). The offered paster has the provision for printing 4 colors on both sides of one web, or 2 colors on both sides of two webs, or single color on both sides of three webs. Non Woven 3D Gusset Box Bag Making Machines a fully automatic machine, widely used in packaging industry. It is loaded with some of the advanced features such as computer fixed length, photo eye tracking, auto stop, step motor feeding material, automatic side correction, folding device, ultrasonic roll off and dependable microcomputer control. We are manufacturer of Non Woven Fabric Bag Making Machine to our clients. We are manufacturer of Automatic Box Type Non Woven Bag Making Machine.